Prioritizing your work can help reduce stress and accomplish it faster with peace of mind. Using the BeingLive.com - Prioritize Tool, setting priorities is simple and easy. 1) Enter the tasks to be completed. 2) Rate each task on a scale of 1 to 10 (1=least, 10=highest) against each criteria. Urgency: Rating based on how soon the task need be completed. Consider any due dates. Interest: Your Interest level to work on it. Importance: How Important the task is to you. Long Term Impact: Long Term Impact of the successful accomplishment of the task on you and your circumstances. 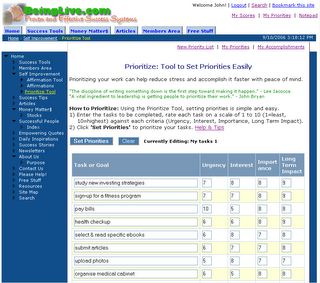 3) Click 'Set Priorities' to prioritize your tasks. Click Clear to empty all the fields and start a new list. Save your prioritized list of tasks, so that you can refer to it later. Click Save to save your priorities. You can group your tasks into different categories like My tasks, Work tasks, Hobbies etc., by naming the Priority List accordingly. 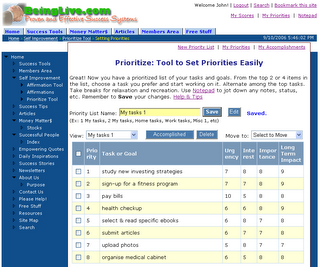 You can view your saved list of priorities from the My Priorities page. Click Edit if you want to add new items, or change the ratings for the current entries. As you start working on the tasks and make progress, the ratings may change. Due to deadline or some other reason, if the urgency of a task changes you can update it accordingly. After you complete a task, click the checkbox next to it and click Accomplished. You can view your completed tasks on My Accomplishments page. You can delete a task by clicking the checkbox next to the task and then clicking the Delete button. Interesting article, I enjoyed it. Nice to create lists for many of us have busy schedules, however we should also find enjoyment from our time spent with others and our projects. I add time for myself on my list. which I’m into captivation this summer division time.